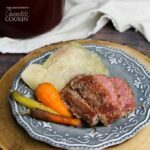 Corned beef and cabbage is a delicious one-pot recipe that has come to symbolize Irish culture in North America, a popular dish for St. Patrick's Day! Place all ingredients in a stockpot and bring to a boil to dissolve sugar and salt, stirring occasionally. Allow the brine to cool completely before submersing the brisket. Top with additional water as needed to completely cover. Refrigerate for up to 10 days to brine. When ready to prepare, place corned beef brisket in large pot (or Dutch oven) and cover with fresh water. Cover pot with lid and bring to a boil, then reduce to a simmer. Continue to simmer for 45 minutes per pound. Peel and chop your vegetables however you'd like - it's more rustic to leave them with a bit of skin. Add the vegetables except the cabbage to the pot when there's about 30 minutes left of cooking time. After 15 minutes, add the cabbage. Remove the pot from the heat and let the meat rest for 10 minutes before serving. This recipe for Corned Beef & Cabbage was printed from AmandasCookin.com - https://amandascookin.com/corned-beef-cabbage/ and can only be printed for education or personal use.